The trackball has 4 buttons, a trackball, and a scrollwheel. Two buttons on top, two on the bottom. I set them up (on my mac) so the top right was the click, top left: right click, bottom right was forward (in a browser) and bottom left was back. Everything was grand and I started getting good at navigating my computer without a normal mouse or my touchpad. Then I brought the mouse into school. To plug into my Ubuntu desktop. I knew it would work on Ubuntu because that’s the system I’d tested out before I’d bought mine. But the button mappings were all wrong. Combine this with the fact that there wasn’t a special program to redo mappings (aka ExpertMouse?) in Linux and the fact that I have no admin rights on my computer and I was stumped. So I hooked the trackball into my mac and connected them using Synergy. Since the mouse was primarily on my laptop, everything worked on my desktop the way I expected. Until today…when the internet was insanely slow, so I couldn’t move my mouse between computers. Then I decided to fix this, once and forever. but I couldn’t figure out what the numbers meant. I did a little more searching and came up with a slightly better mapping. I’ll explain it here because I was so baffled by the online solutions, that I want to have this on hand for me and thought others might find it interesting/useful. When the mouse is in it’s default position, the numbers would read 1 2 3 4 5 6 7 8, I believe. A normal two-button mouse is just 1 2. A lefthanded mouse would be 2 1. This is the solution that I came up with. The 7 was added because I needed all 9 consecutive numbers otherwise I got an error. This works the same as on my macbook. Top right is the click, top left: right click, bottom right is forward (in a browser) and bottom left is back. The scroll wheel hasn’t changed. Ah, adventures in making simple things more complicated! I was talking to a colleague the other day and we started talking about conferences and the people we know. I realized that I know a lot of people in the HCI (Human Computer Interaction) community because of twitter. I use twitter far more than Facebook now, in part because of the lack of pretense that my data is private. I have a large, close community on twitter and communicate with people frequently through that medium. In addition, I have used twitter information to meet up with some HCI researchers. I see you tweet that you’re in Minneapolis, I’ll probably say, “hey, what’s happening? we should meet up.” I’ve also gotten to know a number of researchers more in depth than I could have via blogs or at conferences. These connections have done many things for me. I’ve found roommates for conferences, planned group trips, and found collaborators. And tonight all of us HCI researchers seem to be on twitter to discuss politics. So the internet is this cool thing. You can talk to people online, or as my mom would say “talk” to people online, and write letters, and download music, and record the minutiae of your life. Pretty fast and advanced and you can save shipping costs on purchases, right? Wrong. I decided to buy the Eric Whitacre Concert Download. It’s an online download. I didn’t buy it on Friday or Sunday cause I hadn’t decided if I wanted to buy it yet. It’s $15, I’m a soon-to-be-poor grad student. I went online yesterday to buy it and noticed something strange. The price was listed as $15 plus shipping and handling. That’s odd, I thought to myself, why would they charge shipping on an online download. The total cost for me will be $18.98. $3 shipping and $.98 tax. So. There are people that will address an envelope (at my church) and then mail it to me with a card in it. The card will have a code that I have to go type in on a website to get my download. First, on computing. I am 25 and I sit in my computer history class, twice a week, with students who are sophomores and juniors in college. I know that, computing wise, they are not from my generation. When I TAed a class for freshmen in 2007, they were noticably more modern than me. I was lucky. I had instant messenger in high school, after three years of email and telnet at home. They had had instant messenger in middle school and email all throughout their teen years. They started off on AOL or Compuserve, while I started using ERIC (educational resource information clearinghouse…real thriller material). Sometimes, however, knowing things doesn’t really sink in. Today the prof was talking about the Lisa computer (see above). People were asking about the drives and the prof said they were 5.25″ floppy drives, and took the time to mention that they were originally called floppies because they were actually floppy…as in flexible. Well, yeah, I thought to myself. We called the 3.5″ disks floppies even though they weren’t flexible. Then it hit me, while I loved playing Monopoly off of 5.25″ floppies, most of my classmates didn’t ever use them. 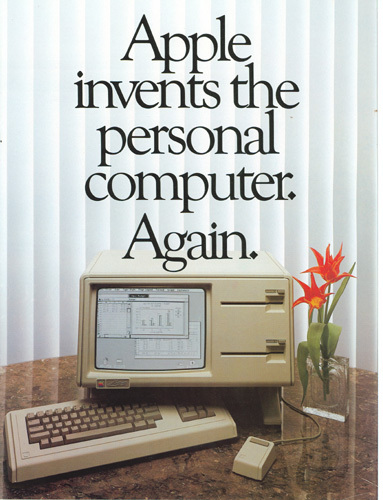 They only know the floppy that is 3.5″ and sturdy… It’s times like this when even being 25 feels old. Movies. Tuesday night is girls night. Ben plays Xbox Live games with friends from undergrad and I go out with a friend, usually for dinner and a movie. The movie usually is supposed to fufill two criteria. First, the movie should be one that we wouldn’t be able to get our boyfriends to watch. Second, the movie should be somewhat uplifting/funny/heartwarming/cheerful/not morbid and horrible. So usual fare includes movies like 27 Dresses, Made of Honor, Forgetting Sarah Marshall, and Mamma Mia! Those are great movies and served their purpose well. The fall lineup has been less than stellar, however, and while we have some 2009 movies on our slate already, we had few fall movies. Two weeks ago, our choices was the swoony Richard Gere movie Nights at Rodanthe. Except for the fact that we ended up sobbing, it was pretty good. But we decided that we were going to ban depressing movies from girls night. Last week we skipped, but this week we were able to see the Duchess. I had thought, briefly about arguing for the British comedy Happy-Go-Lucky, but we wanted to see the Duchess for a while, so there we went.